The counterfeit money detection market is expected to reach USD 3.11 Billion by 2020, growing at a CAGR of 6.9% between 2015 and 2020. Various government laws and enforcements to prevent the circulation of fake currency notes is driving the growth of the counterfeit money detection market. The base year considered is 2014, and the forecast period considered for the market is between 2015 and 2020. Globally, the growing number of fraudulent activities and circulation of fake currencies across various sectors such as retail, gaming, and banking are also the prime causes of the growth of this said market. The growth in new retail automated products, such as mobile point-of-sale terminals, is creating new growth avenues for this market. The report covers the major segments of the market which are product, technology, industry, end device, and geography. The market size estimations for these segments are provided in this report; the key trends and market dynamics related to these segments are also covered under separate chapters for these segments. This research study also involves the extensive use of secondary sources, directories, and databases (such as Hoovers, Bloomberg Business, Factiva, and OneSource) to identify and collect information useful for this study. The research methodology is explained below. After arriving at the overall market size, the total market has been split into several segments and subsegments and confirmed with the key industry experts. The figure below shows the breakdown of primaries on the basis of company type, designation, and region conducted during the research study. This report provides valuable insights regarding ecosystem of this market such as chip & other component manufacturers, original equipment manufacturers (OEMs), system integrators, and end users. The key players of counterfeit money detection systems are Crane Payment Innovations (U.S.), Glory Global Solutions (Japan), Japan Cash Machine Co., Ltd. (Japan), Cummins Allison Corp. (U.S.), Cassida Corporation (U.S.), and Royal Sovereign (U.S.) among others. The counterfeit money detection market is expected to reach USD 3.11 Billion by 2020, growing at a CAGR of 6.9% between 2015 and 2020. The growth of this market is driven by initiatives taken by various governments to implement the counterfeit money detectors to prevent the circulation of fake currency. On a global level, the growing number of fraudulent activities and circulation of fake currency across sectors such as retail, gaming, and banking are also the prime causes for the growth of this said market. The growth in new retail automated products, such as mobile point-of-sale terminals, is creating opportunities for this market. The retail industry is expected to dominate the market for counterfeit money detection. However, the transportation industry is expected to witness the highest growth rate during the forecast period. The increasing deployment of kiosks and vending machines at various transportation facilities such as airports and railway stations is the major driver for the increasing demand for counterfeit money detectors in the transportation industry. Various technologies such as ultraviolet, infrared, magnetic, watermark, microprint, and so on are integrated with the currency detecting devices. Among these, ultraviolet technology is the most popular technology because of its high rate of accuracy for finding a counterfeit note. The magnetic technology is expected to have the highest growth rate. The magnetic properties are monitored with more advanced sensors to detect the genuineness of the banknote. Among the wide range of products offered by various market players, currency sorter is expected to register a high growth rate during the forecast period. 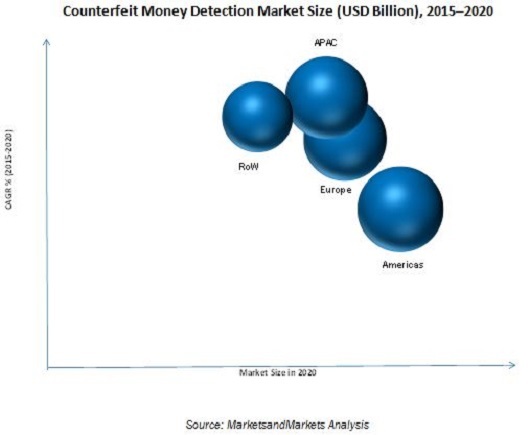 North America is expected to hold the largest share of the counterfeit money detection market during the forecast period, and the market in APAC is expected to grow at the highest CAGR during the forecast period. This growth of the market in APAC can be attributed to the nations such as Japan, China, and Australia. The counterfeit money detection market in APAC is at the growth stage, and the ongoing developments in this region make it a lucrative and high-potential market. Sometimes, the detecting machines fail to find the counterfeit currency notes due to tricky methods adapted by the skilled counterfeiters, causing a low accuracy level or failure shown by detectors, so the growth of the market could be hindered. The major players in this market include Crane Payment Innovations (U.S.), Glory Global Solutions (Japan), Japan Cash Machine Co., Ltd. (Japan), Cummins Allison Corp. (U.S.), Fraud Fighter (U.S.), Cassida Corporation (U.S.), and Royal Sovereign (U.S.) among others. These players adopted various strategies such as new product developments, mergers, partnerships, collaborations, and business expansions to enhance their presence in the counterfeit money detection market. Since the last three years, new product development strategy has been found to be the key strategies adopted by the market players to enhance their leadership in this ecosystem. 13.7 Japan Cash Machine Co., Ltd.
13.9 DRI Mark Products Inc.
13.11 Royal Sovereign International Inc.
13.12 Semacon Business Machines, Inc.